This is our weekly look at fantasy football adjustments you should make based on venue and/or weather. Entering the weekend action for the Conference Championships of the NFL season, knowing which players should see an improvement or decline in their projection can be a key to victory. Fantasy football is at its peak in the NFL regular season, but in a lot of ways, my venue and weather research was made for this sort of playoff weekend. With just four teams of players available in daily, the benefits and penalties those players will see because of the context of their games will make or break lineups. And that should be especially true this weekend, when the two games are set to experience wildly different weather impacts. The early game on Sunday will take place in the dome in New Orleans. I’ve written ad nauseam about Drew Brees’ (+2.5) extreme home/road tendencies, which will make him an excellent fantasy option again this weekend. But I haven’t delved into the splits his skill talent sees, and those don’t all go the way you’d expect. They likely do match expectations for receivers Michael Thomas (+1.9) and Ted Ginn (+1.0). Thomas is hardly bad on the road, but his extra 1.5 targets, 30 yards, and 6.6 PPR points per game at home are necessary to justify his $500 surplus on the field of receivers in DraftKings. 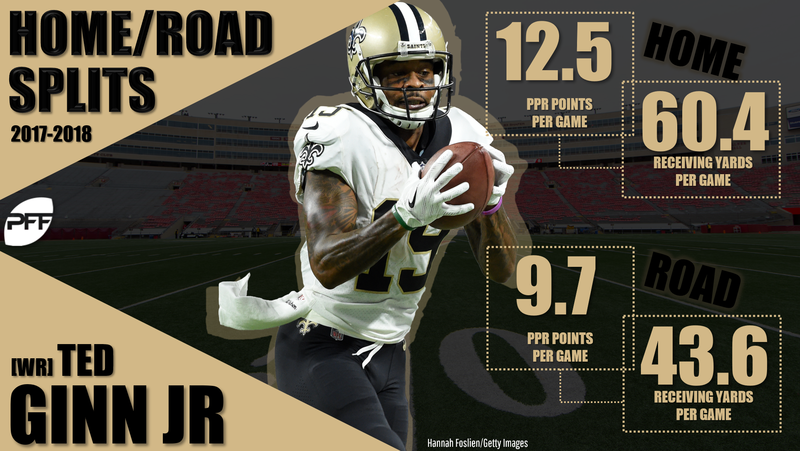 Ginn has managed just two games since September, but he scored 12.5 PPR points per game at home and 8.6 per game on the road in 2017. I’d be comfortable starting either wideout, especially when you consider the extra challenges the options on the other three teams will have to face. Interestingly, neither Alvin Kamara (+0.5) nor Mark Ingram (+0.4) had significant home/road splits in 2018. Typically, reception-heavy backs like Kamara perform relatively well on the road while carry-heavy backs like Ingram perform relatively well at home. I think the reason Kamara and Ingram were less sensitive is because the Saints were unusually successful as a team. Prior to Week 17 when they sat several key starters, the Saints were down two scores on just 11.6% of their plays this season. Only the Bears (6.7%) and Chiefs (9.0%) fared better. That means the Saints rarely suffered the extreme gamescripts that necessitate an over-reliance on passing to play catchup. As 3.5-point favorites on Sunday, they’ll likely avoid those big deficits again, and that makes both Kamara and Ingram attractive fantasy options as usual. Jared Goff (-0.6) doesn’t have the multi-year history of it the way Brees does, but he did score 10 fantasy points per game more at home than on the road this season. My venue adjustments don’t penalize him anything close to that full amount because of the dome bump and his relatively small career track record, but I still don’t love him as a fantasy option this week. 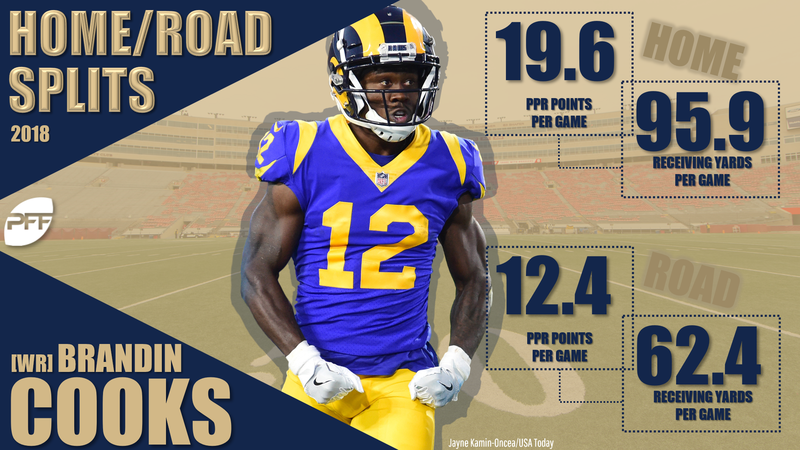 Robert Woods (-0.3) and Brandin Cooks (-0.3) should suffer by extension, but interestingly, only the latter has actually shown home/road splits this season. Woods has had nearly identical reception, yardage, and touchdown totals at home and on the road while Cooks has scored 7.2 fewer PPR points per game on the road. I have an as-yet untested theory that deep threats are more venue-sensitive than shallow targets. With his 13.2-yard average depth of target, Cooks fits the bill of the former. Todd Gurley (-0.3) is the ultimate venue-agnostic running back. He ran for 18 more yards per game at home this season, but he counterbalanced that with 1.3 more catches and 29 more receiving yards per game on the road. It all adds up to an identical total of 26.3 PPR points per game at home and on the road. He would be fine for this game except that the Saints are the best run defense still in the playoffs, and C.J. Anderson (-0.1) has exploded for 66 carries and 6.4 yards per carry over the team’s last three games. I think that Anderson’s heavy involvement with Gurley back last week was specific to the team’s game plan. The Rams had a season-high 48 rushing attempts against the Cowboys, and they’ve actually gone over 40 attempts each of the last three games after not doing so once the first 15 weeks of the season. If the Rams revert to a more balanced attack, I expect Gurley will return to his workhorse status. But I’m uncertain enough that I prefer Kamara over him, especially with his $1,000 discount on DraftKings. The Chiefs and Patriots didn’t need the help, but they seem to have found themselves set to play the most compelling weather game of the season Sunday night. Kansas City will be coming off of a likely 4- to 8-inch snow storm over Friday night and into Saturday morning, and that winter storm has thrown the late-Sunday forecast into flux. The latest predictions I’m seeing call for the heavy day winds to die down by game time and for the kickoff temperature to land on either side but close to 20 degrees Fahrenheit, up substantially over the forecasts from earlier this week. From a projections standpoint, it doesn’t really matter where the temperature falls in that range because there aren’t enough games with extreme-cold temperatures to suss out any differences in their impacts. But below-freezing temperatures in general cut teams’ pass/run ratios by 2.2%, cut quarterback completion percentages by 3.1% and yards per attempt by 0.19 yards, and increase running back yards per carry by 0.26 yards. And those tendencies will likely hurt the fantasy prospects of the myriad skill talent of these two great offenses. Patrick Mahomes’ (-0.2) Chiefs have succeeded in every condition they’ve faced this season, including the cold and remnant snow last weekend. In fact, Mahomes, Tyreek Hill (-0.1), and Travis Kelce (-0.1) have all scored more points on the road than at home this season, although Mahomes’ home line of 305 yards, 2.4 touchdowns, and 0.8 interceptions per game is hardly one to induce pessimism for his performance on Sunday. Still, the big-picture pattern suggests that at least Mahomes and Hill should fall short of their typical fantasy lines. I prefer Brees to Mahomes in daily given his $700 discount. If the cold weather forces the Chiefs to rely more heavily on the run than usual, then Damien Williams (+0.0) is the obvious beneficiary. He set career highs with 30 touches and 154 yards last week. However, there are two reasons to be nervous. First, Spencer Ware (-0.1) returned to practice on Wednesday and could play for the first time since Week 14. Dorian O’Daniel is the only #Chiefs player who won’t practice today. That means Eric Berry and Spencer Ware WILL practice. Second, the Patriots defense was the stingiest for rushing touchdowns in the NFL, cutting their opponents’ rushing scores per attempt by more than 50%. Williams is a high-ceiling, low-floor option this week. Tom Brady (-1.7) has produced fewer yards and fantasy points the colder temperatures have gotten in recent seasons. In a small sample, he’s put up just 236 and 15.2 in sub-30-degree games. Meanwhile, Sony Michel (-0.3) ran for 90.8 yards and scored 14.7 PPR points per game at home and just 55.1 yards and 7.4 PPR points per game on the road this season. 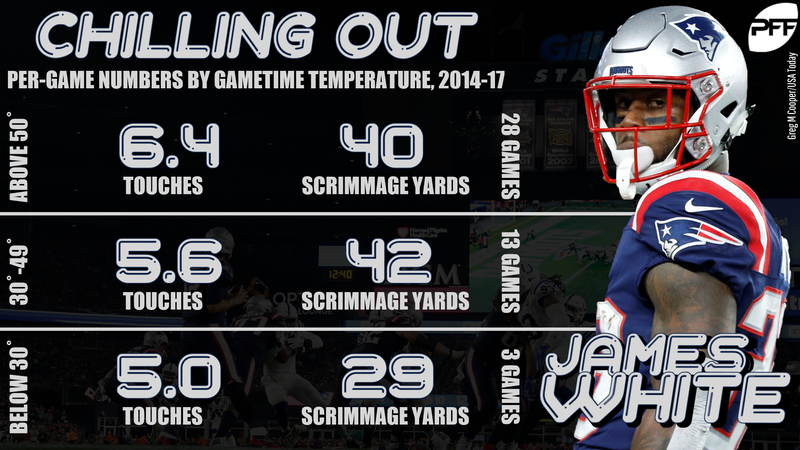 That seems to leave James White (+0.7) as the main matchup beneficiary, especially on the heels of his 15-catch performance in 26-degree temperatures in Foxborough last week. But before you put White in all of your DFS lineups, note that his previous career splits don’t support his status as Brady’s No. 1 cold option. Like most Patriots’ backs, White’s good and bad games don’t follow the same venue and weather split patterns that the backs on other teams tend to. They seem instead to result from the team’s game-specific strategies that seek to exploit defensive matchups. White has the biggest positive venue-and-weather adjustment at the position this week, and I’m happy to use him. But I wouldn’t be surprised to instead see Michel perform counter to his general road trends, especially in the cold weather. I recommend you put both backs in some but not all of your daily lineups. As Brady’s far-and-away No. 1 receiver target, Julian Edelman (-1.7) suffers the biggest projection hit at the position. But I think there are a few reasons to believe it won’t be that bad. First, Edelman is a shallow target with just an 8.0-yard aDOT. Second, he has performed noticeably better on the road than at home this season, which runs counter to the typical receiver trend. 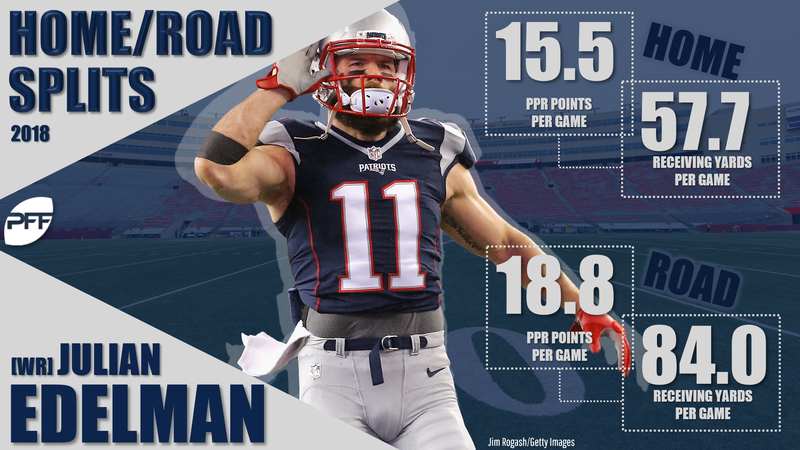 If Edelman represents Brady’s conservative choice among his wideouts, then he may enjoy a similar workload bump to White because of the game conditions. You could talk me into starting Edelman given his $6,600 price on DraftKings. Chris Hogan (-0.8) and Rob Gronkowski (-0.8) are tougher sells, even given their marked discounts. The freezing temperatures may make it difficult for either player to make the big plays he needs to make a major fantasy impact.